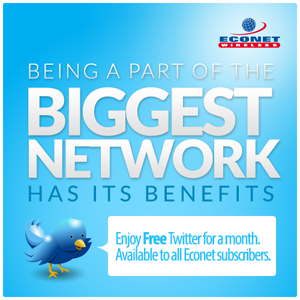 A month ago mobile network operator Econet Wireless announced a one month only free Twitter offer for all its broadband subscribers. The great news for #Twimbos who have been enjoying the special is that it has been extended by another 3 months. It’s going to be free tweeting until 20 November 2014. Being part of the biggest network has its benefits indeed. The service has turned out to be wildly popular with the local Twitter community, even though it’s delivery was less than smooth for most subscribers who had challenges accessing it in the first week or so after it was launched. To Econet’s credit the network has been responsive to any complaints raised on various media regarding any glitches that users experienced with the system. When Econet started this special it looked like a strategy to measure how popular the micro blogging site could actually be in the Zimbabwean market. Econet has been on that tangent for a while, having started with a Twimurenga campaign that was meant to usher in Twitter bundles that would have complemented the existing Facebook and WhatsApp bundles. These add-on broadband services have been largely successful, with IM services like WhatsApp being cited as one of the reasons behind industry wide receding voice revenues. Econet and the other networks are starting to place more emphasis on value and revenue acquired from broadband and overlay services as the traditional voice market loses its lustre in an evolving telecoms industry. Econet’s extended Twitter special will likely make it harder for Econet’s arch-rival Telecel to launch its Twitter bundles, a product that they hinted on a few months ago and seem to be keen on validating through a Twitter survey of sorts. While we wait to see what sort of products will come from the different networks in the next three months and beyond, as a broadband subscriber what sort of bundles and free services would you want to receive? We are all forgetting about net neutrality people. A nice $10 bundle per month subscription to YouTube, Gmail, Google Play, Google+ and wikihow or something. This “net neutrality” business is a rather overdone cliche. Service providers should be free to provide whatever service they deem will please their customers, without being stifled by such cliches as “net neutrality”. What’s next? That all groceries should be treated the same? Let the market decide.